I have often said that bacon makes everything better. Combine it with shrimp and how can’t go wrong. But could it get even better? While going through the pantry I came across a jar of apricot jam and the idea to pair with bacon and shrimp popped into my head. 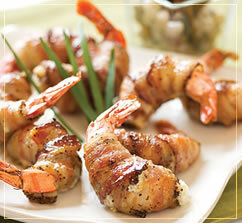 It turned out to be a pretty deliciously inspiration and a great appetizer or entrée. I used large shrimp U-15 so I needed one whole strip of bacon per shrimp if you use smaller shrimp half a piece will do. You can pre-assemble a day or two in advance and bake off when needed. Just wrap them well and keep refrigerated until needed.